Successfully Added Folding Headphone MP3 Player with FM Radio (Wireless Audio Gadget) to your Shopping Cart. Listen to your favorite music on-the-go with this next generation Folding Headphone MP3 Player with FM Radio. This Wireless Audio Gadget is so light and portable you can simply fold it up and carry with you in your backpack or handbag for use at any time and place. With this Headphone, you feel the music, not the headphones. Take the Folding Headphone MP3 player with you wherever you go since music is provided by a SD/MMC card (not included) and is plug-and-play into your computer for easy transferring of your favorite MP3 files. It even comes with an LCD screen and one-touch buttons for play/pause, volume up, volume down, previous track, and next track. Better yet, the built-in FM radio function gives you access to your favorite radio stations on the go, bringing you a whole new world of news, sports event broadcast, and other audio entertainment. When not listening to the built-in MP3 player, you can even use the Folding Headphone MP3 Player as a high-quality replacement to your old earphone/headphones. Connect it to your DVD player, laptop, and computer (or anything with a 3.5mm audio in) for a better listening experience. Better yet, use the audio gadget for voice calls and chatting as the included 3.5mm audio cable comes with a microphone and makes for an ideal replacement as a headset. 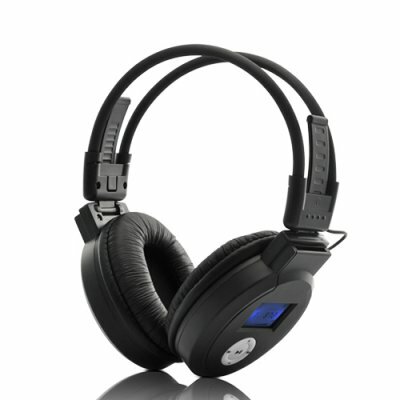 I just receive them today and I love the headphone they are comfortable and the noise canceling is perfect.